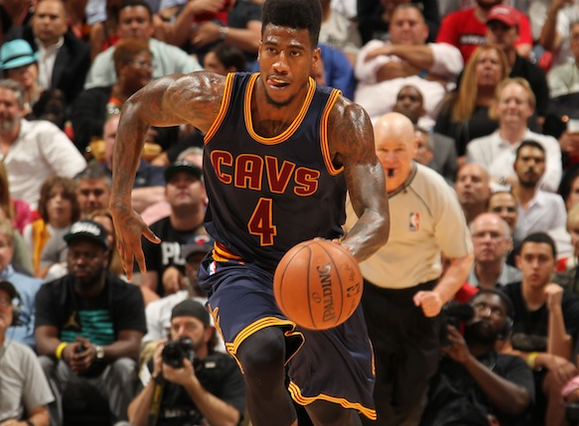 Iman Shumpert has not started a game for the Cleveland Cavaliers this season. Since returning from an injury that first sidelined Shump as a New York Knick, though, he has been a critical and consistent cog off the Cavs bench. Averaging 23 minutes per night for Cleveland, the 6-5 shooting guard has helped anchor coach David Blatt’s defense on the perimeter. While contesting shooters at the three-point line and limiting dribble-penetration, Shumpert is averaging 1.5 steals per night defensively. He’s also collecting 3.5 rebounds to go along with 7 ppg, demonstrating an all-around skill set and motor the Cavaliers lacked prior to his arrival. In his last outing—against a Miami Heat team the Cavaliers could potentially face in a first round Playoff series—Shumpert came off the bench to throw in a personal Cavs-high 17 points on 7-of-12 shooting from the floor. The Oak Park, IL native also connected on three of his six attempts from beyond the arc, snagged four steals, and posted a game-best plus/minus of +28. Prior to a postgame “Welcome To Cleveland” party for Shumpert hosted by Barley House on W.6th Street, Coach Blatt spoke on his reserve guard’s impact. Following the game, Shumpert was asked in a media scrum if he or his teammates had a nickname or slogan for the Cavs’ second unit. He acknowledged the question with a smile, before responding that the only mantra they have is to come in and play hard when their numbers are called. That job in support of LeBron James, Kyrie Irving and Kevin Love isn’t something that’s gone unnoticed by the King. Following Thursday’s victory, LeBron explained what he’s been most impressed with by the reserve group led by Shumpert, Tristan Thompson and others. What it’s also all about for the Cavaliers and a fan base that hasn’t celebrated postseason basketball since 2010 is winning. With a healthy LeBron James in toe, Shumpert has helped Cleveland do specifically that by compiling a 26-7 record since playing his first game for the Cavs on January 23. With towels left on every seat of Quicken Loans Arena for the nationally televised TNT game against the Heat, you could feel that playoff energy looming. After Shumpert and company put in work against Miami, he and a number of teammates attended a party alongside Cavs fans officially welcoming him to town. Shumpert explained how the event came about with Barley House, which was recently named to the National Bar and Restaurant Association’s Top 100 list. Shumpert and a collection of teammates rolled through the red carpet at Barley House before being later presented with a special cake honoring his arrival. Cleveland Browns All-Pro Joe Haden was in the building for the festivities, along with Cavs legend Ron Harper and a number of other local personalities and professional athletes from around the city. While the Shumpert party proved to be a safe and successful celebration of the Miami win, you couldn’t help but wonder about that next party Barley House might host later this summer. Before dreaming about championship parades and customized cakes, though, there’s still plenty of defensive stops to make and victories to secure. Brendan Bowers is an NBA writer who covers the Cavaliers and the NBA in Cleveland for SLAM. Follow him on Twitter @BowersCLE. Images via Getty, Joe Oravec/Barley House.